Aromatherapy massage is a popular item on a spa's menu. In this type of treatment, fragrant therapeutic essential oils are used to activate healing properties in your body. Whether you need to relax, ease muscle tension, or clear out the remnants of a cold, essential oil added to a carrier oil can help alleviate most symptoms. The next time you're traveling and pop into an upscale spa, opt for an aromatherapy massage for a special spin on the traditional rub-down. In a simple Swedish or deep tissue massage, the therapist glides over your skin with an oil or cream that has no scent. In an aromatherapy massage, however, the oil also contains an essential oil (or a blend of essential oils) derived from plants. Essential oils penetrate the body through the skin, creating multiple benefits beyond just their nice smell. They affect your mood, alleviate pain, detoxify your body, and ramp up your immune system, depending on the oil used. 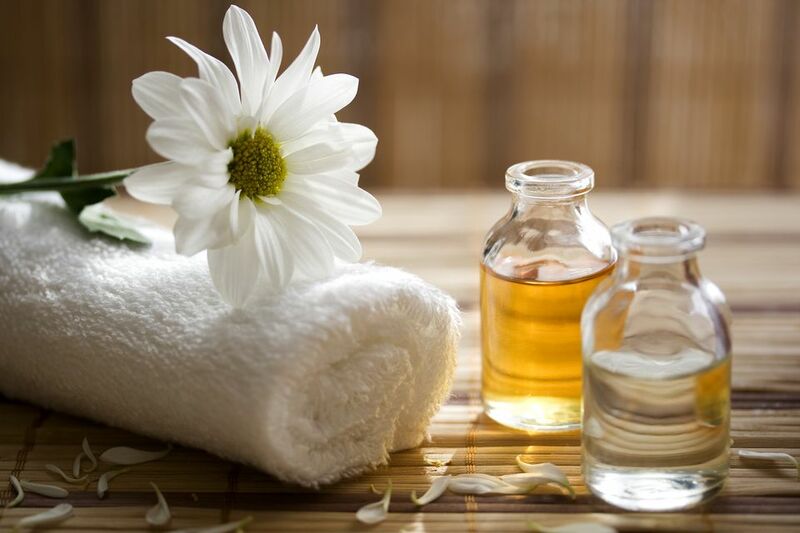 In an aromatherapy massage, essential oils are mixed with a carrier oil like sweet almond, jojoba, or grapeseed. Therapists will then add a couple drops of popular essential oils—like lavender, peppermint, bergamot, rose, or geranium—to the mixture they use in your massage. More sophisticated spas create their own custom blends ahead of time—using up to five oils in a mixture and naming their signature oils for their various effects. A relaxing aromatherapy massage might include oil infused with lavender or bergamot, while peppermint and eucalyptus may be used to soothe sore muscles. After your massage, if you like the oil blend used, you may be able to purchase it at the spa's store. At the beginning of your treatment, the therapist will invite you to smell various blends, describing the essential oils each one contains and their effects. To narrow down your preferred blend, consider which scent resonates with you, as well as what effect you want to achieve from your massage. You can choose something that is relaxing, balancing, or invigorating, based on how you want to feel when you're done. After you choose the oil, your therapist will leave the room, allowing you to disrobe and lay (usually face down) on the table. An aromatherapy massage usually starts with three deep inhalations of the oil you chose, because that's the quickest way to get it into the body. These three breaths also help you relax and become present in the moment. Sometimes, therapists will start with a head massage so that you continue to smell the scent as it's being worked into your body. Essential oils consist of volatile, highly concentrated plant extracts, derived from leaves, bark, roots, seeds, resins, and flowers. Make sure your therapist is using therapeutic-grade essential oils, instead of store-bought varieties. Therapeutic grade oils are higher quality than commercial-grade oils (used in food products or sold in health food stores) and are steam distilled, without the use of chemicals. These oils can also be used in hydrotherapy baths, facials, and body treatments. Synthetic "essential oils," on the other hand, will not have the same therapeutic effects. Fragrances that are made from chemicals lack the therapeutic properties of essential oils. Many scented creams have synthetic fragrances in them, so just because it has an "aroma" doesn't mean it's an aromatherapy oil. But most spas and independent massage therapists are highly knowledgeable and experienced, so it's unlikely they'll use a sub-par product. Still, it's good to know before you book an expensive treatment.